Krasnaya Polyana, Russia • Kikkan Randall shrugged good-naturedly upon learning that she was eliminated in the quarterfinals of an Olympic cross-country ski race Tuesday, but she was hurting. The women&apos;s sprint event represented Randall&apos;s best chance for a history-making medal, and her day ended two races short of the final. "It&apos;s a bummer," Randall said later. "I&apos;ve been waiting for this race for a long time." She was not the only one. As much as Sophie Caldwell&apos;s making the finals was a major breakthrough for the Park City-based U.S. Ski and Snowboard Association, Randall&apos;s early exit was a disappointment. 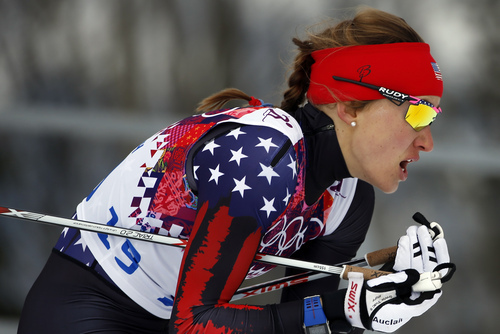 Caldwell fell in the final race and finished a distant sixth, yet she delivered the best-ever Olympic finish for an U.S. women&apos;s cross-country skier. Norway&apos;s Maika Caspersen Falla won the race, bringing home her country&apos;s 100th medal in the sport. In her fourth Olympics, having moved up steadily from a 44th-place finish at Soldier Hollow in 2002, Randall was expected to produce the U.S. team&apos;s first medal in cross-country skiing in 38 years  and the second ever, following Bill Koch&apos;s silver-medal performance in 1976. When Randall missed the cut to the semifinals, "My heart broke," said teammate Jessica Diggins, who will join Randall in next week&apos;s team sprint with medal potential. Tuesday&apos;s was the one Randall targeted, after helping to build a replica of the 1,300-meter Olympic course near her residence in Anchorage, Alaska, following a test event in Russia last year. Born in Salt Lake City while her mother was attending the University of Utah Law School, Randall was positioned to join the short list of Utah natives with Olympic gold medals as a two-time World Cup season sprint champion. After advancing through the qualifying time trials, she said, "I always love the head-to-head racing the best, so I&apos;m looking forward to it." Nicknamed "Kikkanimal," Randall appeared overwhelmingly strong in the early stages of her quarterfinal event. She and Norway&apos;s Marit Bjorgen stood a solid 1-2 well into the race, only to have Germany&apos;s Denise Herrmann overtake them. And then Italy&apos;s Gaia Vuerich charged ahead of Randall as the six skiers came into the stadium to complete a 2-1/2 minute race. Randall tried to recover, but Vuerich edged her by .05 of a second, the margin of Randall&apos;s elimination. Two skiers advanced from each heat, plus two wild cards. Remarkably, no skier from Randall&apos;s quarterfinal heat made the finals. "I was feeling really good," Randall said. "I just didn&apos;t have that power in the last corner." Torin Koos, another four-time Olympian, finished 37th in the men&apos;s qualifying run and was eliminated. The former Ute skier and track and field athlete is scheduled for two more events.